Are You Ready For Some Super Exciting YNS News??? Please Scroll Down For My ABC Toys and Crafts Post! That's right!!! Your Next Stamp is starting their very own line of DIES called Your Next Die!!! and the first one is available TODAY!!! I literally squealed when Karen told me she was going to start offering dies! I am a little bit of a die addict, so this is very exciting to me:) Ok, are you ready to see the new die in action? Don't you love it?! For this card I used the September Jen's Sketch For You To Try along with some Echo Park Paper Co. Everybody Loves Christmas dp. I couldn't stop with just one card, so I made another one this time using The Sweet Stop Sketch #126 and some Authentique Wonder dp. I will leave full recipes below. So how would you like to win this AWESOME new die and coordinating stamp set??? Just leave a comment on all the DT members blogs listed below as well as the Your Next Stamp Blog (Karen's Blog). You must comment on all the blogs to be eligible to win. We can't wait to hear what you think of the new die!!! 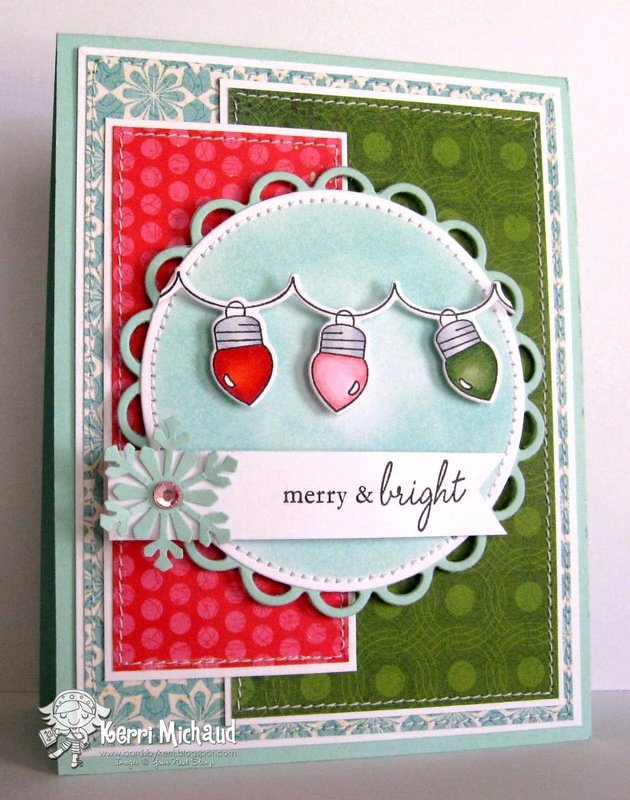 Kerri, both of your cards scream stylish and fab-ulous!Love this die! What a unique and fun die! Love your cards, Kerri! Kerri, both of your cards are so beautiful, you rock! Great job!! Love all the different ways you can use this! Two lovely Christmas Cards. I love your use of layers and color choice. Great Job!!!!! Cards are great. So many ideas for the dies. Your cards are great too - lovin' the little bit of blue thrown in! Kerri...you are amazing girl. I love how you used this die. Stunning cards babes. WOW! 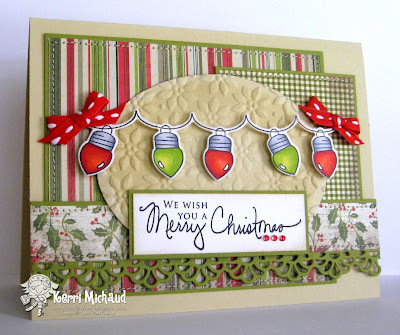 Love those sketch designs and how you incorporated the string of lights into the design! Beautiful Kerri!!! These are lovely Kerri! I like that color combo (something cool about having pink in the mix) and the lovely patterned papers you selected for both of your cards. Your coloring is really pretty too! Such cute cards. I really like the idea of dies and stamps to match. thanks for 2 beautiful cards to inspire us! Your cards are so cute. Love that die. Thanks for a chance to win. Gorgeous cards! Love the dies! Oh your cards absolutely shine Kerri! I so want this die! Love your cards Kerri! These are both just gorgeous! I am so inspired by everyone! Absolutely gorgeous cards. I can not wait to try out this die & stamp set. Oh i just entered the world of dies...i just love them all, this is a fantastic set..something i have not seen before...super cool. okay okay, if I wasn't sold in the very first minute of the launch, then this has sealed the deal. Terrific cards and colour combinations! these are fabulous! awesome coloring! Beautiful Cards! I'm loving this YNS very first die cut! These cards are great! Hugs! What a beautiful christmas cards! The stamps set is wonderful! These are gorgeous! Love the colours! Can't wait to get this set! Super cute cards! 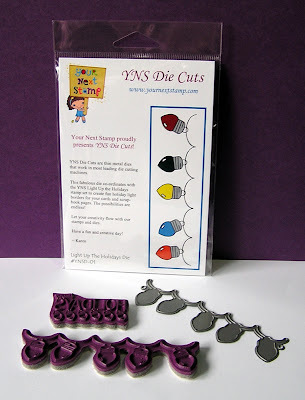 Love the new YNS Die/Stamp combo!!! Both of your cards are beautiful. I really like this new stamp/die combo. Very pretty cards ~ and both are simple enough to be able to mass produce for Christmas!! Love it! love the die and your cards are fabuloouus! Love how you used the stamp and die! Oh my these lights are so cute! I love both of your cards! Oh Kerri...you've showcased this die and stamp set like the rockstar that you are girlie!! LOVE both cards! !